South Shields won their fifth game on the bounce as they continued their Evo-Stik Premier Division title bid on Saturday. Shields defeated Hednesford Town 4-1 at Mariners Park to stay a point behind Farsley Celtic at the top of the table. Nathan Lowe put them ahead in the first half and two goals from Robert Briggs, along with Connor Bell’s first for the club, made the points safe in the second half. The Mariners named an unchanged line-up from the team which triumphed 3-1 at Marine a week earlier, and after a quiet start to the game, they entered the ascendancy. The match burst into life in the ninth minute as Lowe continued his excellent goalscoring form with another fine strike. He picked up a loose ball 25 yards from goal, took it past a defender and rifled an effort into the bottom corner from just outside the box on the right. It was Lowe’s ninth goal in 16 appearances for the Mariners and gave Shields the perfect platform to dominate possession for most of the first half. Hednesford undoubtedly carried a threat, though, as they displayed why they went into the match with much confidence themselves, having won four and drawn two of their previous six games. Despite that, they almost fell further behind on 27 minutes as Briggs tried to catch out goalkeeper Jake Weaver with a free-kick which he aimed at his near post, but the Hednesford stopper just managed to push the ball onto the post before saving a follow-up by Jon Shaw. The Pitmen had half-chances of their own in a first half which was lacking in any further real goalmouth action, with Kieran Wells proving to be their biggest threat, but he was off target with two efforts. The closest they came to levelling was a shot from 12 yards by Reece King which Liam Connell did well to push to safety with a fine reaction stop. Shields returned for the second half with renewed vigour and extended their lead in the 52nd minute as Bell latched onto a flicked header by Briggs and, with Weaver advancing, he slotted the ball under the goalkeeper to score a much-deserved first goal for the club. The Mariners went on to have their best spell of the game as they set about making the points safe. They went close to making it three almost immediately as Bell turned provider, stealing the ball high up the pitch before teeing up Briggs, whose drive was beaten away by Weaver. Weaver was powerless to prevent the third Shields goal before the hour mark, though, as a Lowe corner from the right was half-cleared and then played back to him by Shaw, and he sent in a terrific low cross which Briggs turned in from close range. Hednesford pulled a goal back in the 67th minute as a corner was bundled in by Brad Wells, offering them a glimmer of a lifeline. Shields were soon creating chances again and almost restored their three-goal lead as a pass was threaded through to Luke Daly and he was denied by a good Weaver save. The Mariners were given a golden opportunity to score their fourth when Phil Turnbull was brought down on the left of the penalty area, and Briggs stepped up to convert from the spot and score his 16th goal of the season. With the game now won, Shields were able to relax in the closing stages as another three points were chalked off. With Farsley Celtic and Warrington Town both picking up maximum points elsewhere, though, it was as you were at the top of the table. Shields will hope to register another victory on Tuesday when they travel to Workington. 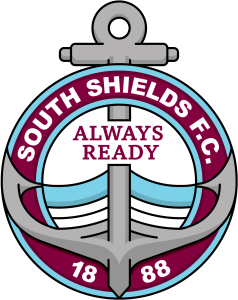 SOUTH SHIELDS: Connell, Baxter, Adams (Lough 61), Shaw (c), Morse, Turnbull, Daly, Briggs, Mason (Cogdon 61), Lowe, Bell (Gillies 79). Subs not used: Mouanda, Foley. Goals: Lowe (9), Bell (52), Briggs (58, pen 77). WORDS: Daniel Prince. IMAGE: Kev Wilson.